Hereford United are within reach of the £78,000 target they need to avoid a winding-up order after being handed a £10,000 donation by Heineken. The club are due at the Royal Courts of Justice in London on Monday to answer a petition brought by HR Revenue & Customs over an unpaid tax bill. But the cheque from the brewery giants, who own Hereford cider-makers Bulmers, has left the Bulls just £8,000 short. Hereford now hope that Saturday's gate at Edgar Street will finish the job. 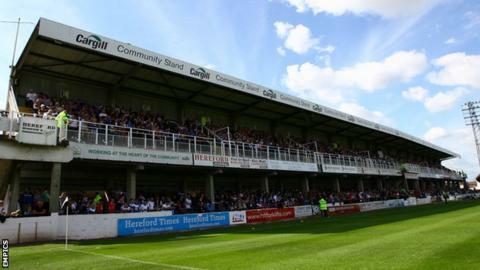 Hereford United's attendances have halved in five seasons on their way down from League One to the Conference Premier. As well as the home game with Woking, there is still money to be generated by two fund-raising shows put on for free by London-based comedian Omid Djalili. The Conference Premier club have attracted average home crowds of just 1,701 this season - half of what they pulled in at Edgar Street five years ago - and are still losing money by the week. But, needing home crowds of 2,000 to break even, Bulls fans responded at last week's home game with Grimsby Town, swelling the gate to 2,545. And a similar response on Saturday would mean that the club can once again avoid having to go to court. The Bulls, who have been struggling financially ever since being relegated from the Football League in May 2012, avoided a winding-up order in late January over the non-payment of their £36,800 PAYE bill for November and December. The club faced a similar situation in 2013 but were able to settle thanks to a £70,000 payment from their televised FA Cup first-round tie against Cheltenham.